The Patriots head to Kansas City to take on the Chiefs in Week 4. Follow along here for live updates of the game, including commentary and analysis from Boston and Kansas City. AJ Jenkins and Donnie Avery getting on the board against this elite #Patriots secondary. Wow, Andy Reid totally botches managing the clock! Who knew?? Dwayne Bowe has 5 receptions for 81 yds. Reid trying to let the Pats off the hook and they won't let him. Unreal. I'm looking for Revis Island on a map...anyone? Bueller? 22 yard FG is good by Cairo Santos is good! Chiefs take 17-0 lead into the locker room. Scoring drive goes 7 plays, 85 yards, 2:24 and ends on a 22-yard FG. First half ends mercifully. Worse than Saints in '09? Wow. MT @NEPD_Loyko : @ErikFrenz Only time in Belichick's career Patriots have given up over 300 yards in a half. #Patriots made some monumental comebacks last year. This would rank right up there. 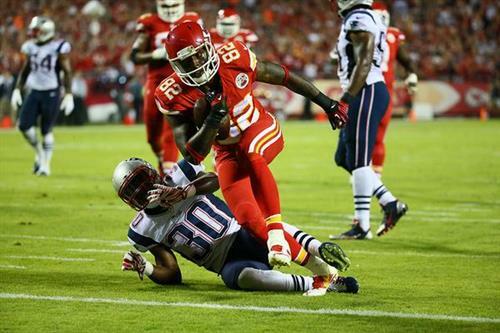 All you need to know: #Patriots have 96 yards of total offense and 5 first downs, #Chiefs have 303 yards of offense and 17 first downs. This is more like Boston Patriots level play - they might give up 600 yards tonight - really? Sometimes long-running successes in sports end with a sudden and decisive thud. We could be watching that happen right now. Vollmer resumes his spot at RT. Again, five backs active and they pass on every play. Somehow the Patriots end up with the ball on the fumble. Either way, yet another punt coming. Matthew Slater is the only guy doing anything. For those wondering, last time the #Patriots were shut out was 2006 (21-0 loss to the #Dolphins ). For the love of God please look to someone other than Edelman. Creepy whispering voice in press box says "noise record broken." If the Pats think things will get easier after this they are mistaken. Cincinnati will destroy this team next Sunday night. Cincinnati is ALOT better than KC. Brandon Bolden got hurt trying to cover the kick, walked gingerly off the field. I predicted 10-6 before the season and got hooted at. I now think 9-7 will be lucky. Alex Smith was asked if he feels bad for Tom Brady watching a game go that way: "Do I feel bad for Tom Brady? No offense to Tom, but no."